Exeter University I are current League Champions with a 14/1 record, and have won the Play Offs on 3 previous occasions the most recent being last year. Newton Abbot Pacers finished 2nd in the league with a 13/2 record, and have been Play Off winners on 4 previous occasions. In the league they beat Exeter University once by 4 points, and lost twice by 14 and 15 points – this game had a lot to live up to after the first game. Exeter University Ladies came into this game on a high following an impressive season, Newton Abbot Pacers on the other hand have had a season of injuries to key players and fluctuation with their team, but still finishing an impressive 2nd in the league – it looked a good match up and Pacers had a few players back to give their team a sprinkling of experience. Pacers started off the game well, with their reliance on the quick breaks of Jasmine HODGE (8 points) supported by other players, the university looked to dominate inside with Gaila COSTAS and Tara MATIJA, but also had the outside threat of Chloe ALPHONSO who dropped a couple of 3 pointers – this helped the university to a 23-15 first quarter lead. The 2nd period went much the same, Pacers seemed to have no answer to the strong inside play of COSTAS who extended her personal points tally to 15 points – it seemed the only thing that would save Pacers from COSTAS was herself getting into foul trouble and forcing her to sit out large periods of the game. Half time came and Pacers had a mountain to climb 46-31 down. The second half went the same way, and despite HODGES impressive personal tally of 22 points, Pacers had no answer to the inside play which was demonstrated in the final quarter with every University point scored from inside. COSTAS took MVP with 27 points (despite getting fouled out), and MATIJA hit 15 points to provide no respite for Pacers. 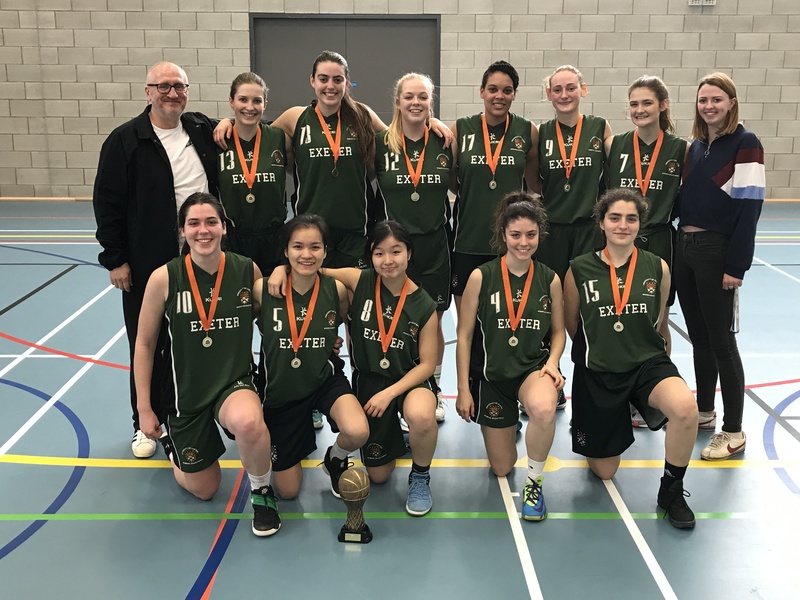 Exeter University won 76 – 64 and took the Play Off title for a 5th time.